The End Of Epic EVE? There is a tendency – especially among older players – to declare that EVE is missing content on a grand epic scale these days, implying that this is a central aspect of the game. In response, I would like to look at how that view of the EVE experience has developed over time, and how meaningful it is. Have we become overly attached to a specific notion of what the grand scale endgame of EVE is supposed to look like, and if so why? Are we correct in saying that great conflicts on a massive scale are an indicator for a vibrant and healthy game? Is there even such a thing as one universally applicable definition of “epic experience” in EVE? Every so often a vaguely interested gamer will ask on reddit whether it is “too late” to start playing EVE. The answers to this will vary a lot, and admittedly in many cases they are encouraging and positive. 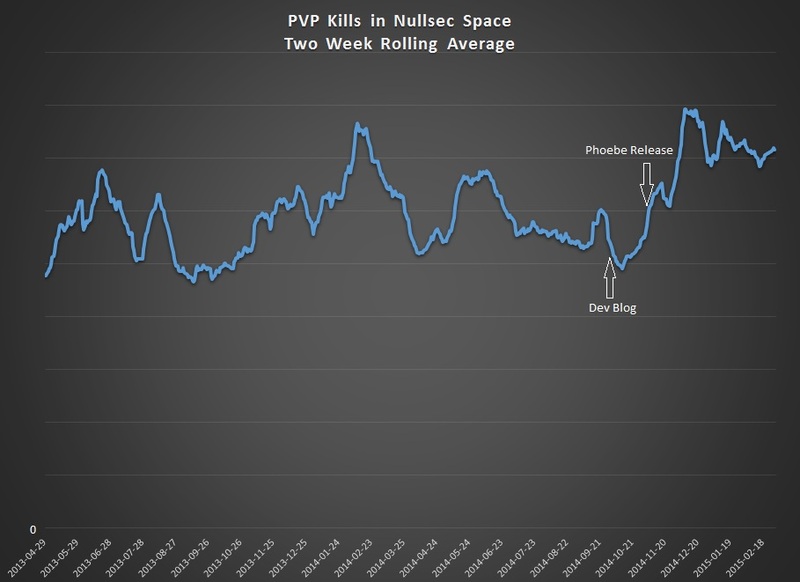 Still, there is also a strong sense among many EVE players that the game is past its peak. Concurrent user count is brought forward, the lack of great wars is cited, and the firm establishment of old powers at the top of the food chain is used as an argument that there is hardly any room left for new players to stand out and achieve great things. One of the main culprits who is often blamed for this is of course the Goonswarm-led coalition. I can’t even count anymore how often I have heard that they “have won EVE” and that it is senseless to even try and dethrone them. It is not only them who supposedly hold sovereign space in a stranglehold. Both in the past and in the present Russian-led coalitions have been accused of the same. Over the years several other major factions have been said to quench any ambition of new players with their static power structures which enforce compliance. The sentiment that EVE is under control of established powerplayers is not only restricted to sovereign nullsec space though. When I returned to the game and decided to go live in lowsec, many of my nullsec dwelling peer group warned me that I won’t have any fun there. Supposedly, “elite PvPers” with high-grade implants, maxed link alts, and forces of killmail-hungry gankers at their back are ready to crush anybody who even dares to undock and fly around in “their” space. According to some, wormhole space of today is being monopolised by a network of extortionist overlords who will evict everyone who doesn’t pay their protection fee. In highsec, Incursions are farmed by organised groups of professionals with extremely expensive ships and you won’t even be allowed near any of that lucrative content if you can’t fly or afford what they consider the standard fit. These views, and many like them, are often expressed in the continuous buzz of comments, articles, blog posts, and discussions among members of the community. CCP have even acknowledged a number of those issues and are playing catch-up with them in an effort to introduce mechanics which either create counter-incentives or expand available content to allow for more niches where newly formed groups can flourish. Many players feel powerless and frustrated by the dominance of established groups in the game, and the view they present becomes even more discouraging when compared with an idealised version of what the glorious past of EVE supposedly was like. A recent article in the wider gaming media has reminded everyone, yet again, that EVE is the most longstanding continuously successful MMO on the market. Only World of Warcraft comes close to EVE in age and continued success. Older MMOs have long vanished into obscurity and newer ones struggle to prove that they have the sustainability of these two titles. Unlike WoW, however, the EVE Universe does not only advance because of content provided by the publisher, it changes because players influence the world directly. This results in an impressive player driven history, and there are still many people around who have lived through much of it and even shaped it. These old players are not the only ones who are in a position to present a view of an epic past full of grand conflicts and exciting political stratagems; a game world where the resourceful, ruthless, cunning or daring player was still able to leave their mark on history. 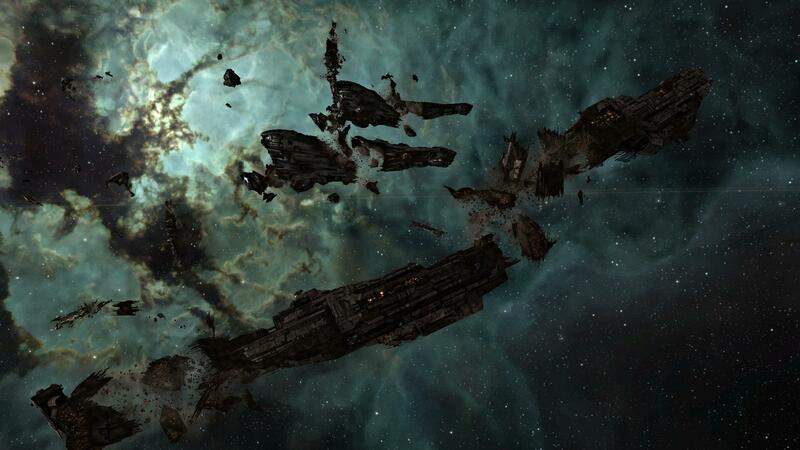 With the release of Andrew Groen’s book on EVE history, we can now even hold a report of those monumental past conflicts in our hands, and many newer players can’t help but wonder whether something on such a grand scale can still happen. Long before Andrew Groen wrote his book, the Evelopedia already featured articles about the Great Wars of the past. No war has since been called “Great”. 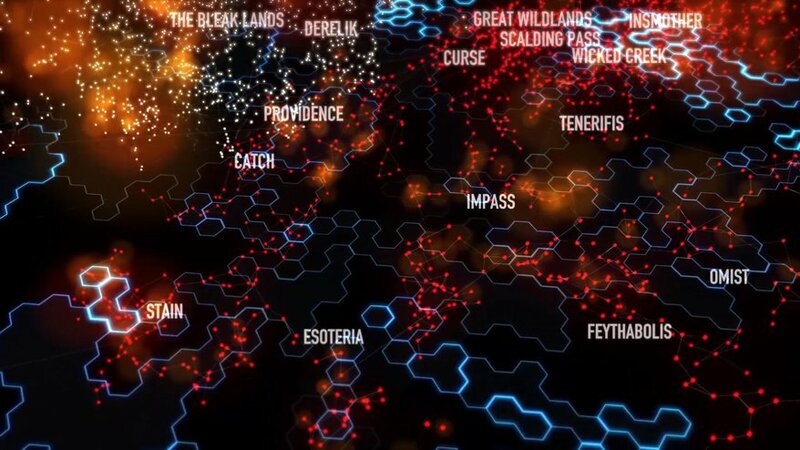 Even in their attempt to use a more recent conflict as the basis for a space-opera type book, The Mittani Media did not call it the “The Great Fountain War”, despite the fact that this campaign also spanned months and included almost all major forces in EVE. The same can be said about the North against South war of 2012 or the Halloween War of 2013-2014 which included the most destructive battle ever fought in gaming history. There are pitfalls in this back-referential way of thinking which have been discussed at length by historians and sociologists. There is of course nostalgia. Many of the older players will think fondly of the times when they gained the prominence they have today, when they achieved their first great success and when they reached the peak of their game. Certainly we are justifiably impressed by the great achievements of those who came before us, but we have to be wary of letting our view of the present become shaped too strongly by their views of “how things were back in my day”. The extreme opposite is another trap we have to avoid too. One manifestation of this is called tempocentrism. This word describes a fallacy where people fail to see how current developments are formed by past events. During the most recent dramatic upheavals in the EVE community, there were many people on one side who complained about being persecuted unfairly. This ignores the path which lead to such aggressive antagonism, whether it is justified or not. Tempocentrism can also lead to a myopic interpretation of the present where its significance as “future history” is not fully appreciated. Many players today do not fully grasp how much has already changed. In only a few years, EVE nullsec came from being dominated by two or three power blocks to a much more balkanised state, and that development is still ongoing. We are all writing EVE history right now by the way we conduct ourselves under those conditions. Another similar misconception is called chronofetishism. In this case the assumption prevails that present developments can be entirely explained by present conditions. During the discussion about Aegis sovereignty mechanics there were many examples of that. People blamed the developers that they have changed the mechanics in such a way that certain playstyles have become impossible to maintain without recognising that those very same game strategies had previously developed over many years as an adaptation to prior mechanics. They failed to recognise that those methods of playing EVE did not exist a priori in a continuum. The question remains how we should react to such tendencies. Is there a way to view contemporary EVE in a way that acknowledges the great events of the past without declaring the present incapable to live up to such grand historical precedents? The idea that there is an “End of History” is not just something EVE players come up with. Many respected philosophers and social scientists have been proponents of this idea, especially after the end of WWII and again after the end of the Cold War, with the USA remaining as the last military superpower and capitalism seemingly prevailing as the last remaining paradigm of socio-political and economic organisation worldwide. The conditions in EVE are not so dissimilar. We now have only one major coalition remaining that can most likely defend itself against everyone else in a classic “Great War” style sov conflict. They probably even have the power to destroy any other faction in the game on those terms, if they would like to do so. Like in the real world, that does not mean that major conflicts have come to an end or that the dynamic of grand-scale historical change has ground to a halt. Tempocentrism tempts us into thinking that there won’t be any more “Great Wars”. Even a respectable writer among the EVE playerbase like Matterall expresses that as an established fact in his recent piece which was released here and on TMC. I would dispute that, though, just as I dispute the same when it comes to the real world. Sure, there are currently no massive wars fought on continent-spanning battlefields between the immense militaries of sovereign states anymore. There isn’t even a low intensity conflict fought with espionage, diplomacy and proxy wars like we had it in the second half of the 20th century, but global warfare is a fact. Daesh, and Al-Qaeda before them, have declared war against all of western society and all muslims who do not share their interpretation of Islam. They are driving this conflict forward with just as much zeal and relentlessness as the parties in the great wars of the 20th century did. Their opponents are deploying forces all over the world in the “War On Terror” and use every advanced method of modern warfare and intelligence that they have at their disposal. In the course of this, we have seen that military victory in a given country, like Afghanistan or Iraq, has become meaningless. Indeed, the grand clashes of massed forces have come to an end, but global warfare has not. I would argue that EVE is going through a similar phase. Goonswarm and their coalition are attacked at any opportunity where they present soft targets. Whether it’s ratting carriers who are ganked in the depths of Deklein by people sneaking through wormholes, harassment campaigns conducted by MOA, or even the metagaming war of words that is playing out on reddit and elsewhere, the conflict is alive and active. Furthermore there appears to be more cluster-wide warfare than in any given period which saw major conflicts. Outside of stabilised areas like Providence, the territories controlled by Goonswarm and their allies, or the Russian-led Geminate sovereignty holders, there is constant PvP and even sov-warfare. In the past, we have seen major campaigns that rolled over whole regions and involved large blocs of allied forces, but those were peak events in an otherwise rather low-intensity standoff between the respective powers. Today, warfare between smaller alliances is a continuous affair, just ask anyone in Phoebe Freeport Republic or people south of the line from Fountain to Cache. Statistics presented by CCP show that too. 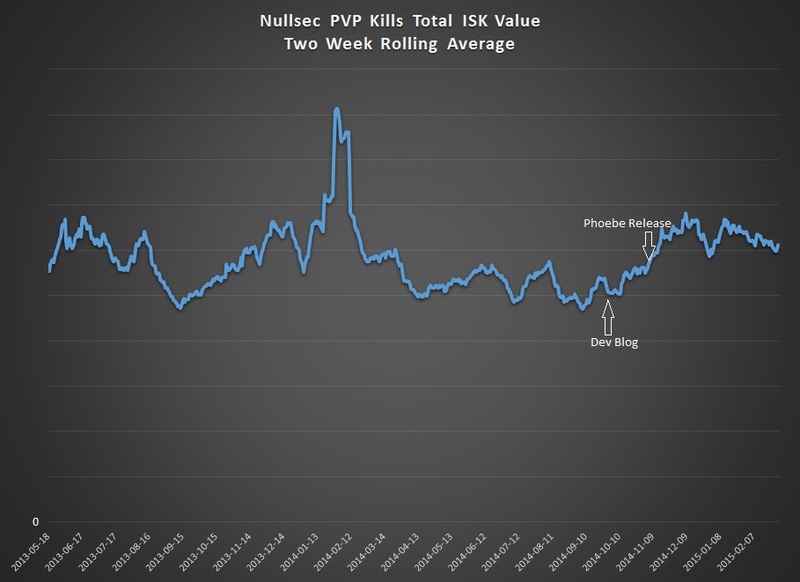 In the following graph we can see the high kill values during the fountain war in the summer of 2013, and the great peak of B-R5B in the beginning of 2014, but for the rest of the time the total ISK value of ships killed remains at a lower level. After the Phoebe expansion this general average value has shifted upwards noticeably. It is not only the total value of destroyed ships which has shifted upwards on average though. When we look at the number of kills rather than the value, the effect is even more pronounced. We can see that the kill count of the post-Phoebe period even surpasses the amount of destroyed ships during recent major wars. Despite this increase in PvP activity, that multitude of localised conflicts don’t make the news because we have become used to an ever increasing level of superlatives. From the first Titan killed, to the battle of B-R5RB, which saw more Titans die than all EVE battles combined, the players and CCP got overly fixated on those mediagenic extremes, but are they really an indicator of an epic gameplay experience? I recently watched the youtube videos featuring the battles of M0o. Those guys were considered one of the most legendary fighters in the early days of EVE. They didn’t have supercaps or massive fleets, but they invented many tactics which nobody had thought of back then. Many of their tactical innovations are staples of today, like capacitor warfare or bait tanking. Current players might lament that they won’t be able to put their mark on history in the same way, but that is a tempocentristic fallacy. New ships that offer fresh tactical possibilities come out the whole time, and the most recent patch actually includes some that could change fleet warfare in profound ways. New doctrines and fitting metas get invented every few months and a group of smart new players who have not yet had their creativity restricted by conventional wisdom may yet come up with something that nobody even considered as a viable option. We also have to ask ourselves how important the “Great Wars” of EVE history really are to create an “epic experience”. I have been part of large battles as well as small gang engagements, and based on that I can say that it is an impressive experience if a battle escalates to the point where triage carriers, dreads and even supercaps are joining the fight. That awe-inspiring experience does not become particularly enhanced, however, if supercaps are deployed by the dozens and fleet sizes number in the hundreds. In fact it muddles and cheapens the experience apart from degrading it into a terrible TiDi grind. As far as epic goes, one of the most captivating series of battle videos – Rooks&Kings’s Clarion Call – shows battles fought with dozens of ships rather than hundreds. Wormhole players have long dealt with reduced fleet sizes and in Factional Warfare swiftly moving smaller ships have often provided more exciting content than large fleets which grind through each other’s hitpoints. 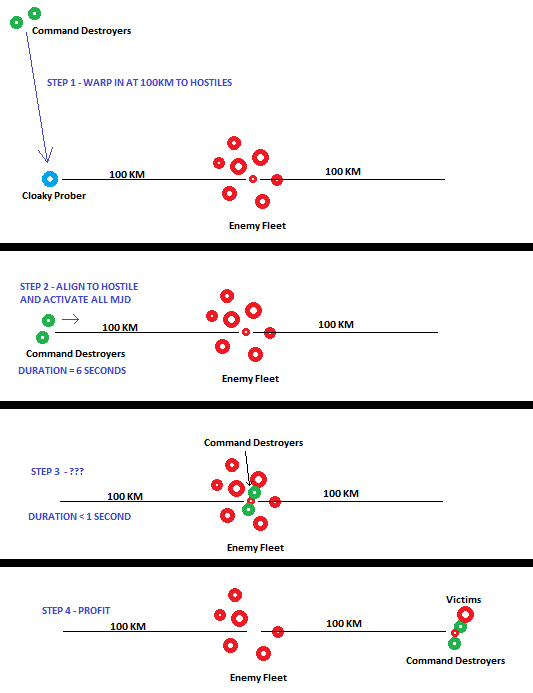 Fighting with their backs against the wall, defending their single home system from an invader, is a profoundly cathartic experience for wormhole players, and in Faction Warfare, controlling the warzone after many months of unrelenting fights surely plays on an epic scale from the individual player’s viewpoint. I dare going so far as to say that today’s new players have a higher chance to become part of something that they can experience as deeply impressive than they had in a long time. There is a lot of old money in the game and once you have the skillpoints, getting the necessary hardware to participate has never been easier. These days, even small to medium sized alliances have access to capital ships and considerable funds they can sink into warfare. In a game world where several of those smaller powers fight each other over pockets of space, a new player can be part of something that changes the map without having to wait for a coalition leader’s decision that it’s time for a major campaign. The exhilarating promise of the “I Was There” trailer has become actual in-game reality. Fortunately, CCP have recognised that they have to steer away from marketing EVE as a game of incredibly large battles and superlatives, but rather emphasize the personal experience where even comparatively small achievements can become stepping stones in every player’s “hero’s journey”. The success of small groups like Signal Cartel, Wingspan Deliveries or Phoebe Freeport Republic shows that many players crave an environment in which they can be meaningful as an individual and gain a sense of personal achievement. I would even say that the recent popularity of Faction Warfare, and lowsec PvP in general, has to do a lot with the fact that individual players can appreciate the effect they have on the outcome of conflicts without having to be a bloc-level FC or supercapital commander. In the light of this, I propose that it is about time we stop clinging to an outdated notion of “epic content”, let go of our preconceived expectations and join the increasing number of players who develop their smaller scale narratives which are no less impressive or rewarding on a personal scale. Epic is a word that describes things which happen on a grand scale, but it also carries the meaning of a long and difficult journey which is crowned by great achievements. EVE is not necessarily epic because it can bring forth “Great Wars”, it is epic because it has an ever evolving history which is written by the actions of players who can achieve great things against difficult odds over the course of many years.